There are few people these days who truly understand and appreciate the complex and miraculous potential of the human body. Most people would respond by saying we only use 10% of our brain, but the brain is not the source of that potential. It is consciousness that is the “Commander” of our being! The brain is the “command center” which directs activity into the nervous system, vital systems, vital organs, and meridians, but there is far more to this activity than the organic body parts. 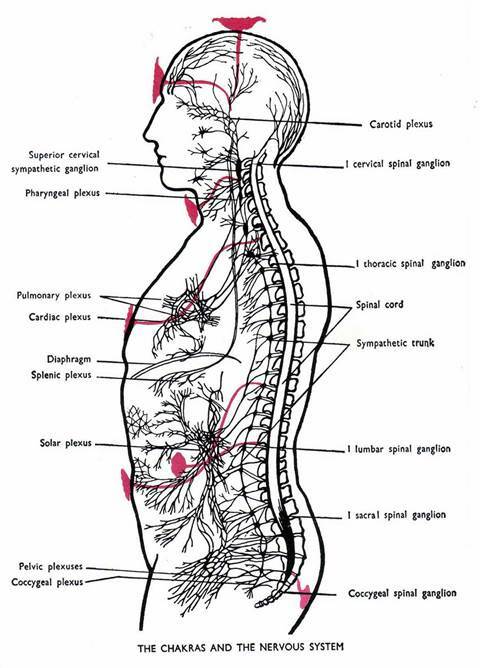 As one example, the diagram below shows how our nervous system has groupings of neurological centers located along the spinal column which extend into the body from the head to the lower torso. These centers are known to those who practice meditation and are referred to as the chakras. The chakras are the means by which consciousness expresses various attributes of our physical, emotional, mental, and spiritual being. On the physical level we experience the instincts, impulses, and sexual desire of the body; in the psyche we experience self-perception and emotions; in the mental we experience reason, abstract and concrete thinking as well as the mental faculties; and in the stillness of spirit we can know the divine. 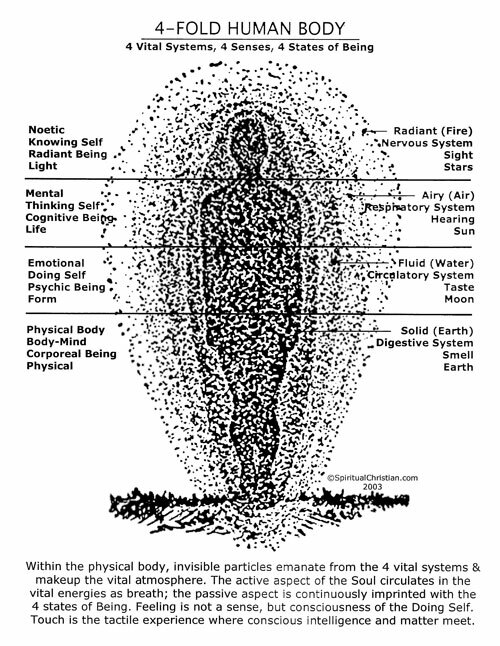 The physical body (see diagram below) is comprised of elemental matter: fire, air, water, and earth. Each of the substantial or physical elements has a corresponding insubstantial or invisible aspect – the invisible attribute of fire is light; the invisible attribute of air is life; the invisible attribute of water is form; and the invisible attribute of earth is nature’s potential. The elemental fire courses through our nervous system as vital light which enlivens our brain and stimulates our nerves and muscles making movement possible; vital light animates the world and stimulates the optic nerve making sight possible. This vital light is the same radiant light which emanates from the stars. For humans, the physical body could not exist without oxygen; air is synonymous with life. The element of air is in our flesh and blood; and it is the means by which sound is conveyed to our ears as vibration stimulates the eardrum making hearing possible. In the element of water, the physical form is mostly comprised of liquids or vital fluids including blood. It is through food mixing with saliva in the mouth that we get our sense of taste. The miraculous element of earth makes possible the physical diversity of nature; it is through the sense of smell that physical nature connects with the earth element. Nature and the physical body come to us from the feminine aspect of Creation (matter, mater, mother). The physical body of matter has no self-conscious intelligence of its own; it is only conscious of its elemental function which is a “blind mechanistic impetus” of nature. However, it is from conscious intelligence, the masculine aspect of Creation which penetrates our bodies of nature-matter, that we are endowed with life and the light of intelligence or consciousness. As self-conscious beings, we are conscious that we are conscious meaning that we are conscious as consciousness. Only intelligence can be conscious as consciousness; elemental matter can only be conscious of its function and blindly follows its imbedded inclinations. Matter is inert; in and of itself it has no life, but it can “come alive” when infused with and directed by consciousness. In this case, particles of matter become “alive and conscious” of their individual biological functions only, and only within a specific species or organism; biological mutation leads to specialization of functions within that particular environment. Conscious intelligence is our true nature; the physical body is our temporary abode while we gain life experience for the soul. This means that as we become increasingly conscious of consciousness, we discover the truth, universal laws and living symbolism within our spiritual nature, we recognize our oneness with God, and we see it represented in universal patterns. 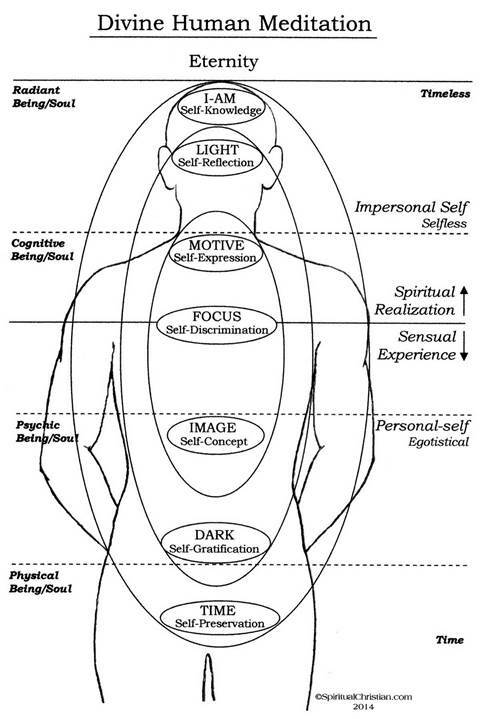 As the diagram above indicates, the second insubstantial energy field surrounding our corporeal body is the psychological (emotional/cognitive) level of our being. This is where conscious intelligence and nature-matter intermingle in the body. It could be said that this field of experience is where worldly and bodily awareness meets the perception of the mind giving us our psycho/corporeal being. In other words, our physical experience of the world and of the body’s instincts, impulses, aches, pains, desires, and fears are registered and explained (to ourselves) by our perceptual/ego-mind (the “chattering-mind”). Now the ego-mind is not the brightest bulb on the string, so the narrative we humans receive regarding our bodily experiences in the world tends to be exaggerated, superficial, and inaccurate. The result of this misinformation regarding our state of being creates emotions which are generated by fear, uncertainty, and insecurity as to our personal well-being. As you probably realize by now, the psyche is the origin of our psychological state. The psyche is all about the personal self and in each of the 7 neurological centers or chakras, there is a distinct expression of the personal self. This level of our being is where the self-concept or self-image forms and the ego/personality is the result. The physical body and the ego/personality team up together and express through the 5 lower chakras and for the majority of people, this composite consciousness or self-image is who they think they are. Next, on the mental level most people know about the reasoning mind, the rational mind, the conceptual mind, abstract and concrete thinking, but few people know about the mental faculties (diagram below). These will be of particular interest to those who are familiar with the characteristics of the psyche through the chakra system. The mental faculties function through the neurology just as the psyche does, but with very different results. The only way to fully understand these faculties is through deep meditation. The mental faculties come from Thinking and Destiny by Harold Percival; linking the faculties to the chakra system is my doing. The I-AM faculty represents Individuality which is our true identity with the Divine. The I-AM faculty enables consciousness to maintain an identity of self and to know the self as an individual distinct from other individuals. The ego/personality “borrows” this sense of identity to form the self-concept which it identifies with the physical body. The I-AM knows its progress and condition through time; it conveys a sense of permanence to the other faculties. Identity, continuity, and permanence would have no meaning without the I-AM faculty nor could knowledge be acquired. Without the I-AM faculty there would be no power to reflect, no purpose in life, no grasp of conditions and environments nor the power to change them; man would be an animal only. The Light faculty is the means through which Light manifests in the different levels of consciousness. Through the Light faculty, all things are made known to the other faculties. When the Light is focused on a specific subject, the knowledge or nature of that subject is revealed. Mental perception would not be possible without the Light faculty. When the Light faculty is directed to higher consciousness, the universal mind may be perceived and experienced by the individual mind. The motive faculty is very important among the faculties because it chooses, decides, and determines the direction of the life experience. The motive faculty determines the choices an individual will make based on the ideals and values that have been embraced in life. Motive is the creative cause and force behind the actions that develop consciousness. The focus faculty is unique among the faculties in that it can appear in all 4 regions of the body and it can engage any of the other faculties when it has been properly developed. The focus faculty is the key to the development of consciousness in meditation. The different stages of meditation unfold as the focus faculty directs the Light faculty to specific regions of the body to initiate purification and transformation of consciousness. The image faculty has the ability to shape, to hold, and to give form to unformed nature-matter; it creates the form or pattern by which matter takes shape. The image faculty can reproduce forms that have existed in the past and examine distinct details of those forms; it can reveal the involution and evolution of forms. The image faculty is the basis for the self-concept; it is the means by which the conceptual mind creates sensual images that entice and attract people to the physical world. These images can be inspiring, creative, and constructive when under the influence of the Light faculty or they can be tempting, destructive, distorted, and misleading when under the influence of the dark faculty. Without the image faculty, one could not conceive of, relate to, or picture: form, color, or matter. The dark faculty is a force that blindly opposes order, interferes with, and obscures the activity of the other faculties. It is the adversary. Like its name implies, it is a great emptiness that attempts to recreate itself; it causes blindness, dullness, and confusion to the mind; it hinders the mind and senses from perceiving beauty, form, and color; it interferes with self-reflection, and prevents single-mindedness; it opposes reason and knowledge; and it works to hinder the development of Self-identity. Yet, without the opposing force of the dark faculty, the other faculties would cease to function and consciousness would be void of individuality, perspective, and vitality. Contact, union, concealment, obscuration, and transformation would not be possible without the dark faculty. It is the means by which sleep manifests in the body. The time faculty reveals the measure and dimension of bodies, the revolutions, separations, combinations, and changes in their relationship to each other; it makes clear the nature of matter. Time makes itself known in the manifested worlds by revealing to the mind the changes that take place in matter; time also keeps a record of these changes. Movement, order, change, and rhythm could not be understood nor used without the time faculty. In meditation, time is experienced below the heart, and eternity or timelessness is experienced above the heart. In a newly published book on moral psychology, entitled The Righteous Mind, by Jonathan Haidt, the author reveals that humans act out in their life experiences based on a variety of moral modules. Haidt posits that people are triggered negatively in various situations they perceive as being unfair or harmful, or when another person betrays or cheats them. On the positive side, people respond strongly to things they consider to be sacred and to things to which they are loyal. The book explores 6 moral modules (the positive & negative attributes of each) related to social, religious, and political beliefs by both liberal and conservative individuals. The political and social arena is an ideal setting to view the reactions of individuals to the changes which affect their preferred worldview. In the book, these moral modules were discussed relative to the authors’ awakening realization of their significance, but there was no particular order as to how these morals were related to the human emotional/mental perspective of life. For me, an insight came in a morning meditation revealing how these moral modules integrated seamlessly with the 2 diagrams above – the psychic states and the mental faculties. These moral foundations “completed the circle” showing the psychic (emotional), moral, and mental capabilities which humans have in their responses to life’s experiences. 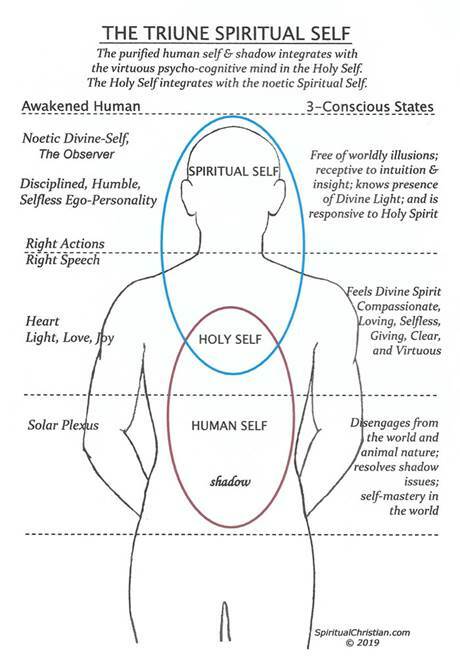 These 3 conscious states are laid out in the 7-tiered template below showing their synchronistic relationship to one another. 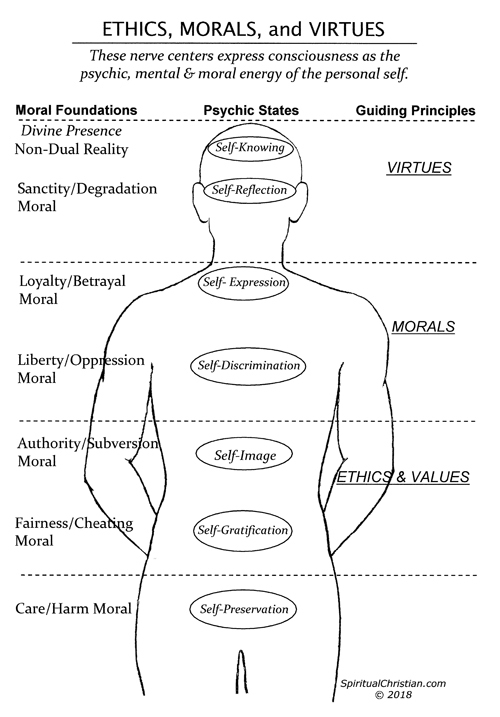 Not surprising, the layout of the moral foundations in the diagram below coincided with the book’s conclusion which was that liberals only use 3 modules, and their political ideology comes primarily from the Care/Harm and Fairness/Cheating modules whereas, conservatives use all the modules. 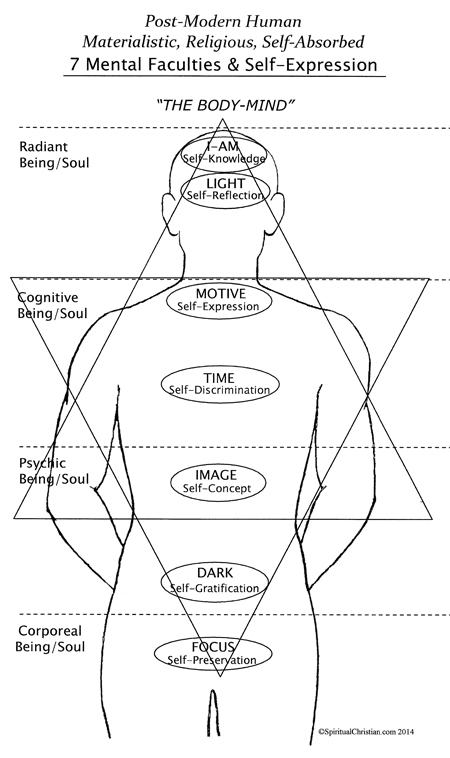 Although the behaviors of conservatives and liberals are highlighted in the book, the diagram below reveals how these 3 conscious states in the human individual complement and reinforce a unique perspective on each of the 7 levels. The moral foundation of liberals being based primarily on the 2 lower modules of Care/Harm and Fairness/Cheating explains their ideology of equality for all. The third module from the bottom, the Authority/Subversion module, is of interest to liberals as it is also the source of the Power Drive in humans which is required to push their agenda or if necessary, to exercise subversive powers to thwart the conservative agenda. In the Liberty/Oppression module, liberals have shown disdain for Liberty and the Bill of Rights in their agenda against free speech, the second amendment, and freedom of religion. Furthermore, it is no surprise that in the Loyalty/Betrayal module, liberals have taken the position of betrayal as they express a lack of respect for our flag and little love for our country and beloved Founders. The same holds true for the Sanctity/Degradation module especially in terms of the rule of law verses anarchy; liberals, as we have seen in the news, choose anarchy as they degrade the rule of law and the police who enforce it. If there is any doubt regarding their attitude, wait and see the words and actions of the left when Congress attempts to carry out its duty of filling the vacancy in the Supreme Court this summer as well as the reaction to the November election. Note: It is interesting that the positive attributes in the moral foundations of people are the same characteristics found in Christian patriots…. 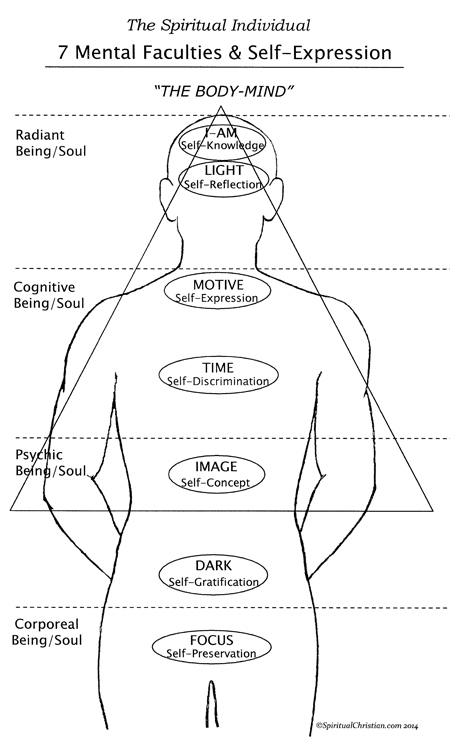 The following diagrams have combined the psychic and mental states in their corresponding centers to show how the psychological expressions and mental faculties of the individual are configured and experienced in the neurological system of the human body. The morals, beliefs, and orientation of each individual regarding their body and the world determine which of these centers of intelligence are activated to create their perception and interpretation of reality. Secular individuals tend to believe that reality consists exclusively of the material, sensual experiences of the world, thus they rarely encounter spiritual consciousness or life experiences in the top two chakras. Having thus formulated an illusory perspective which places the personal self in “the center of the universe,” secular people believe their intellect is the highest order of intelligence on the planet. For them, this unique position in the order of the universe gives them the “all-knowing” intellect and the moral high-ground (self-righteousness) to recreate the world in their own image. They feel it is their “responsibility” to let the unenlightened masses know what must be done to “make things right” in the world whether it is climate change, welfare, abortion, or immigration. Consequently, based on human nature, these people seek power in the world to direct and control all the people who remain ignorant of their “enlightened” worldview. Since these people already know everything, they do not self-reflect or give consideration to other people’s perspectives. Spiritual people are acutely aware of their place in the order of the universe because first and foremost, they acknowledge the presence of a Creator and are continuously receptive to intuition and divine inspiration for personal guidance. People who are spiritually aware realize that the material world is a deceptive, distracting, and enticing illusion for the ego/personality of the average human being. That is, the material reality of this world is an ever-changing, temporal, superficial backdrop upon which the scenes of life are being played out; this illusion is primarily generated from the 3 lower chakras. Those with a spiritual orientation keep their focus on the centers of higher consciousness and work to minimize the influence and misdirection of the ego/personality in their lives. The unseen spiritual energies in the higher chakras are “in play in this world” also. Spiritual reality does not change, and its laws and principles can be known and utilized so as to create a harmonious, peaceful, and enlightening life experience. Consequently, the spiritual person keeps consciousness focused inward on the spiritual nature (as indicated by the triangle below) rather than outward on the desires, fears, and appetites of the ego/personality, the corporeal body, and the illusions of the world. Post-modern Americans tend to live in both of the realms just described. They embody many of the materially-minded characteristics of secular people in their political, social, and working lives. Generally speaking, six days of the week they enjoy the material things in life, are distracted by the activities of life, and are highly skilled at entertaining themselves as a means of relaxing. In America on Sunday, many citizens turn away from the world and acknowledge their Creator and give thanks for the many blessings they have been given. In most cases, those who attend church have clearly established values which make them patriotic, family oriented, kind-hearted and generous. Until recently, Americans have enjoyed a unique balance between the spiritual and material perspectives of the world. 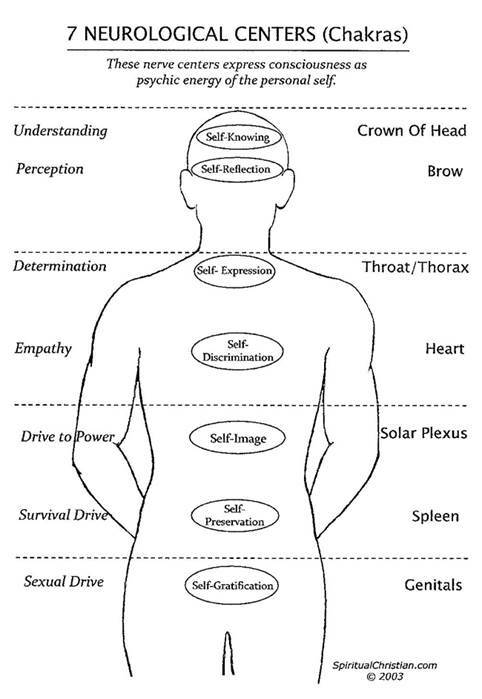 Thus far, we have examined the physical, emotional, and mental levels of being. The single most important insight to take away from this discussion is that we humans are NOT our physical bodies. Although we inhabit and embody this amazing physical form as well as perceive and engage life through the senses, the body of nature-matter does NOT have self-consciousness awareness. It is a lifeless lump of elements which return to the earth when the spirit and soul leave the body. The conscious intelligence of each individual human comes from the triune Self being integrated into the body of matter. This miraculous body has been designed and configured to express these different states of consciousness. The reason it is referred to as the triune Self is that it has 3 aspects or expressions of conscious intelligence – noetic or spiritual, mental, and the “emotional” psyche. 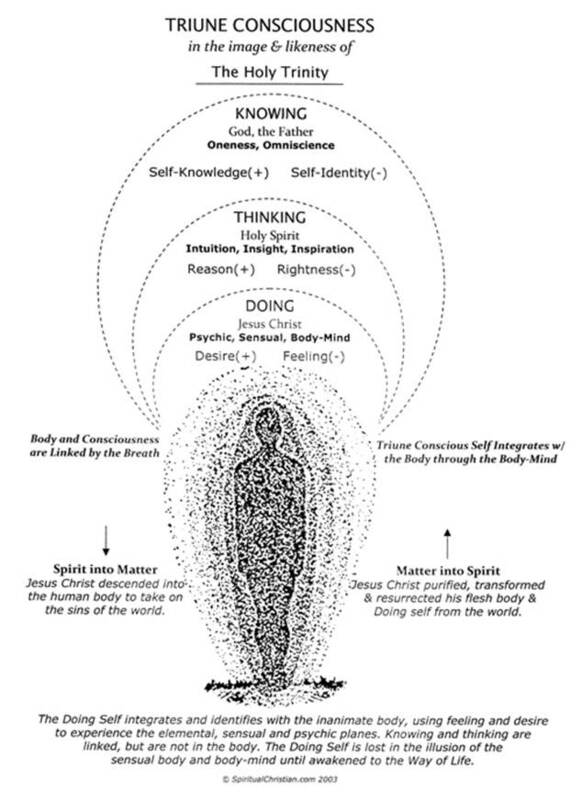 As the diagram below indicates, these 3 aspects of intelligence are known respectively as knowing, thinking, and doing or experiencing and they are integrated into the 4-fold physical body. Although conscious intelligence is our waking awareness, each of these 3 states engages that awareness in a distinctly different manner. First of all, the knower or spiritual presence of our being is not engaged in our everyday awareness or daily activities unless a concerted effort is made to keep it present. The knower has a definite “foothold” in the higher consciousness, but at this point in the (lack of) spiritual development of humanity, it resides more outside of the body than within. Focused meditation and spiritual development bring noetic consciousness more into the “present moment” awareness, but this requires discipline to maintain. The thinker or mental consciousness is more present in our everyday awareness than is the spiritual, but the majority of it is not “in the body” either because present day humans are not capable of utilizing it. This is the primary reason that intuition, insight, and inspiration are so elusive for most people. The higher attributes of the mental consciousness are reason and rightness; the reasoning mind is connected to the divine mind and rightness is what we experience as our conscience. Reason and conscience, being aligned with the spirit, are not susceptible to the influence of the ego/personality and they are not subject to relativism, popular opinion, or manipulation. The lesser refined attributes of the mental state are the rational and concrete minds which are aligned with the doer and the ego/personality. Now to switch gears – the doer or psychic/emotional consciousness is mostly integrated with the physical body to the point that humans are unable to distinguish one from the other; in these teachings, this conjoined state of consciousness and the body is referred to as the body-mind. As a result of the body-mind, the emotional consciousness or human psyche has the ability to formulate a self-image which it does by identifying with the physical body and thereby creating the ego/personality. This is who most people “think” that they are. The primary attributes of the doing self are feeling and desire, and it is through this medium of feeling/desire that we experience and interpret life in the body and in the material world. Simply stated, desire is the same as the force of attraction/repulsion, so desire moves you about in the world either toward the things you like or away from the things you don’t. The feelings you have when you are moved about through these worldly experiences will end up as your personal interpretation of life and will eventually form your worldview. The majority of worldly experiences are smoothly and quietly registered through the solar plexus chakra onto the soul, but the fearful, sudden, embarrassing, or extreme experiences can make that nerve center feel like a “knot in your gut” at times. Before we are born into this world for another life experience, we are made to forget that we are light beings from Eternity. This is done to make our spirit ignorant of its origin; so we become subservient to the physical body experience thus allowing the soul to benefit from life experiences which seem to be new and original. In fact, these experiences are the next carefully crafted series of life lessons in a long educational process for enlightening and refining the soul and spirit. Therefore, humans awaken (See: Perception) so slowly and gradually over the course of 2 decades that they come to believe that they are their physical bodies. Being completely immersed in the illusion of material existence, humans spend the majority of their time trying to create and maintain homeostasis in their psycho-corporeal being. To accomplish this they must feed, sustain, entertain, and manage the physical body’s desires, fears, and appetites as well as appease and pacify unresolved emotional states and unravel various psychological “issues.” All the while, the ego/personality is chattering non-stop in their heads distracting them with non-essential, superficial, distorted, unreliable, convoluted, misinformation about the worldly illusion which contains absolutely nothing beneficial or helpful to the well-being of the soul or spirit. Most people educate their minds and develop a talent, and a few seek the higher spiritual knowledge; but the majority of the human race remains lost in the illusion and desires of the body-mind and the material world. If we were to stop and truly consider the power of physical nature, we would find it hard to comprehend the intense and compelling hold with which elemental matter grips living human beings. We are virtually trapped in an elemental body of matter, trapped in a sensual, material world and driven by fear and necessity to sustain this physical form or face the prospect of death. To perceive life exclusively from this physical level of reality is depressing, but for many people this is the only reality they have known or will know. All human beings would be condemned to this desperate, lonely, animalistic, survival experience if Jesus Christ had not been willing to sacrifice his life to break the grip of this dark and compelling illusion to awaken the spirit of life within the body. We hear the phrase that Jesus Christ took on the sins of the world, which means that he was the first to take on the consciousness of the psycho-corporeal body and the collective shadow of humanity (See: The Shadow-Recognizing our Unconscious Self) with the singular purpose of breaking through the illusion and delusion which is perpetrated by this sensual world, and literally purified and raised the physical form into the Light of God. He transformed the “sins of the world” by transforming the darkness, weaknesses, and delusions of the psycho-corporeal being which humans embody in this life. He opened a spiritual pathway so each one of us could experience freedom and Eternal Life – freedom of our spirit and soul from the grip of lifeless elemental matter and from the dark, sensual enticements nature creates, but we have to make the effort to follow the path. The Way, the Truth, and the Life of Jesus Christ are a divine gift given to all of humanity by the Holy Trinity – it is truly the gift that keeps on giving. The True Temple is the Body of Man in which God dwells by the Spirit. 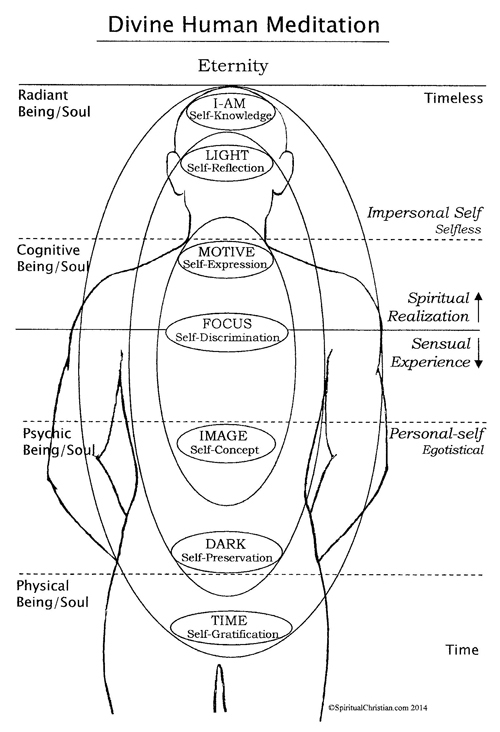 The following diagram is useful as a reference in meditation for understanding the centers of conscious expression in the body. Meditation upon these “Spheres of Influence” will take your understanding of our divine-human nature to another level.